Busy day at work? No time to cook? Tempted to just order out? Then consider this quick and easy Ginger Veggie Stir Fry that you can whip up in minutes! And you have a quick and healthy dinner in minutes. And the best part of all? The secret to making this so quickly? 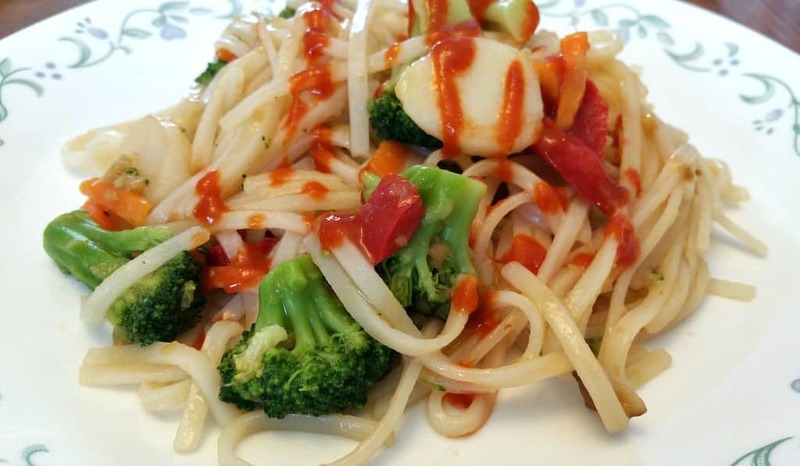 Pre-made rice noodles that only take 10 minutes to cook, frozen stir fry veggies you just add to the pasta water, and this delicious Ginger Stir Fry Sauce that literally only takes minutes to cook. Anyone should be able to make this regardless of their cooking expertise! The really cool thing about stir frys is you can use a different sauce every time to change-up the flavors. For instance, I sometimes use my Asian Stir Fry Sauce, and other times I might feel like a Thai Peanut Sauce. In this recipe, I’ll show you how to whip up this tasty Ginger Stir Fry Sauce that easily compares to anything you’d buy in a restaurant. Let’s start with the noodles. I really like to use these Thai Kitchen Rice Noodles. Seriously, if you can boil water, you can make these noodles! Take your favorite pasta pot and fill it about halfway with cold water, and then set your burner to boil. Once the water is boiling, turn off the heat and add your noodles. That’s it! (for this recipe I use about 1/2 a package). After your noodles are in the water, add in a bag of your favorite frozen stir fry veggies. Last night I used a bag of Broccoli Stir Fry Veggies from Birds Eye. But use whatever type of veggie you like. In my package, I had broccoli, carrots, onions, water chestnuts, mushrooms, and red bell peppers. Just dump in the whole package right along with your noodles, and set your timer to 10 minutes. In a small bowl whisk together 1/2 cup of veggie broth, 2 Tablespoons of Soy Sauce, 1 Tablespoon of Rice Wine Mirin, (or you can sub in any white wine, or even water), 2 teaspoons of Sugar, and 1/2 teaspoon of Rice Wine Vinegar. Also mix 1 teaspoon of cornstarch and 1 teaspoon of water together and stir that in. Set aside for now. You’re also going to need a pretty good hunk of Ginger, enough for 2 Tablespoons of minced ginger. I used a piece that was about the size of my ring finger. Peel and chop as finely as you can. In a small saucepan, add the ginger, 1/2 teaspoon (or more depending on your taste) of your favorite Chili Garlic Paste, and 1 Tablespoon of Soy Sauce. Simmer this on low heat until the ginger becomes nice and soft, then pour in the bowl of sauce ingredients you set aside earlier. Whisk this on med-low heat until it thickens. At this point, I like to dump the entire contents of my saucepan into my blender to make sure all those little chunks of ginger get pulverized into the sauce. By now your Noodles and Veggies should be done. Drain the water from your pasta/veggies and return everything to the pan. Pour in your sauce and stir to coat evenly. 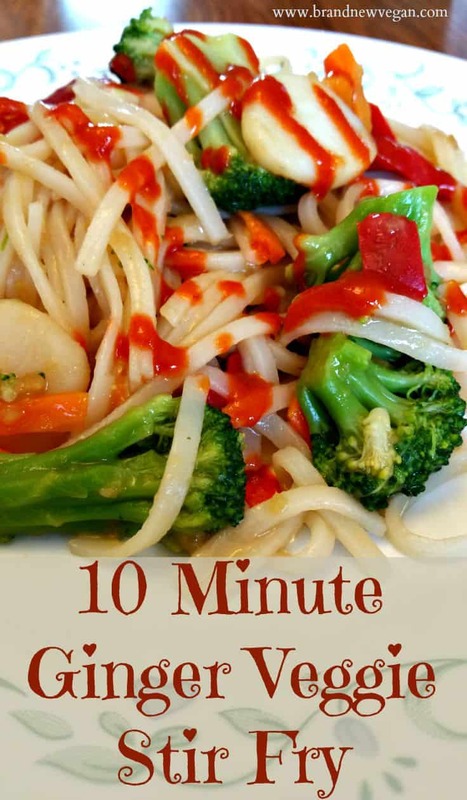 A quick and easy Ginger Veggie Stir Fry ready in 10 minutes! Perfect for those days when you don't have much time to cook! Fill pasta pot halfway with cold water and set to boil. Once water comes to a boil, turn off heat and add noodles and veggies. Set timer to 10 minutes. In a small bowl, whisk together broth, 2 Tbls soy sauce, wine, sugar, cornstarch mixture, and vinegar. Set aside. Simmer until softened and then add in remaining sauce ingredients. Simmer until thickened and then pulse in blender until liquefied. Drain noodles and veggies and return to pan. Stir in sauce and serve. This looks great and adding the sauce in the last step will work really well for us as one of our kids isn’t into flavor… hopefully she’ll grow out of that!